The populated printed circuit board is furnished with a two trimmer potentiometers. Trimmer potentiometer RV1, "BIAS ADJ," is user-calibrated to obtain the specified tone frequency range. 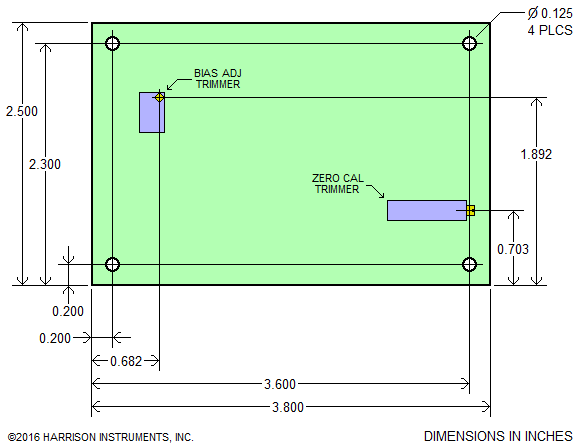 Trimmer potentiometer RV2, "ZERO CAL," is user-calibrated to obtain the specified relationship of hand distance and tone frequency. The calibration procedure for the trimmer potentiometers is described in the 102 Minimum Theremin Kit Assembly Instructions. To ensure proper calibration, this product should be used with the 102-ANT antenna assembly. Text, images, and format ©2013, 2016 by Harrison Instruments, Incorporated. No part of this page may be reproduced without express written consent of the copyright holder.